I think that scented laundry products are fabulous. What is not so great is that many laundry enhancers lose their scent within a day or two. I received Purex Crystals Aromatherapy in the Well Being to test out. 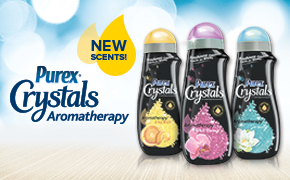 The crystals are an in-wash scent booster which eliminates odor and freshens laundry. There are two other scent choices: Energy and Serenity. They are citrus and floral scents which are blended with essential oils. Just add the crystals to the washer with your clothes. They are safe to use on all loads and high efficiency washers. Most importantly, it keeps your clothes with a fresh laundry scent for weeks. Well being smells like fresh blossoms. It's not an overpowering scent at all. The great scent lasts for weeks as well. This product is located in the fabric softener aisle of your favorite store. Visit Purex for more information.